Following on from changes to Aged Care which commenced on 1 July 2014, the way a resident and their family pay for aged care changed. Since this time residents have still continued to experience quality aged care in a bush like setting, without regard to whether they have the means to pay for their accomdation or pay a RAD (Refundable Accomdation Deposit) or not. A resident and family is now given a choice upon entry to a facility as to whether they wish to pay a RAD (formerly known as an accommodation bond), or an equivalent daily payment (a periodic payment also known as a 'Daily Accommodation Payment 'or 'DAP') or a combination of both. If the Centrelink Asset Assessment deems that you cannot pay the fees necessary, then you can enter as a funded resident as per the previous program. The RAD is paid as a lump sum amount and the DAP accrues daily and is paid monthly. The combination payment includes both a partial lump sum and daily payments. 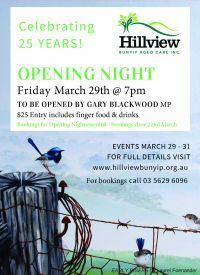 For more information contact Hillview on 5629 6096 during business hours to make an appointment to discuss your situation regarding entering residential aged care. Stop Press - Building Works have well and truly commenced and by March 2019 12 new rooms will be available for the older residents of our community to enjoy quality residential aged care.